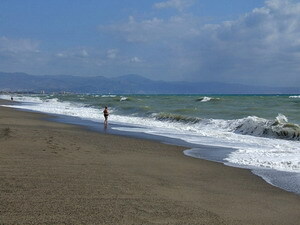 Torremolinos is 12 kms from Malaga city and the international airport. The town has a railway station, where it is possible to catch the Renfe train which runs between Malaga city and Fuengirola, giving easy access to the other resorts in the area. There are also numerous buses, both local and long-distance, giving more transport options. 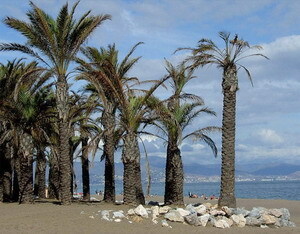 Close by resorts are Benalmadena, Fuengirola and Marbella - great for days out during your stay. Parts of the town look a little seedy, but give it a chance, as the authorities are making major changes, improving the beachfront, planting palm trees and flower beds and generally prettying up the town. If you explore, you will find the traditional narrow streets of Torremolinos, with their many little shops, restaurants and bars are still very attractive and enjoyable to stroll. The beaches are just gorgeous. Torremolinos's coast covers more than 6 kms and is divided into six beaches: Los Alamos, Playamar, Bajondillo, Carihuela, Montemar and Del Saltillo. A flight of steps known as Cuesta del Tajo takes you through El Bajondillo down to the beach - quite a walk down, and if you get tired from your day on the sand, there is an elevator to take you up to the main town again (at a cost of 50c per person). There is a long seafront promenade which runs past the old fishing village of La Carihuela all the way to the neighbouring resort of Benalmadena. 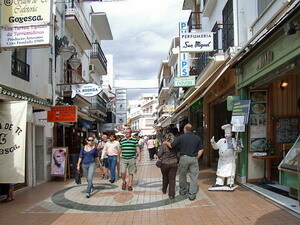 La Carihuela has retained much of its original character and is famous for its great seafood restaurants. Part of the beachfront has many palm trees growing in the sand - reminding the author strongly of the TV series "Lost"! Besides the beaches and the town itself, there are several nearby attractions, including the Crocodile Park. The park is home to the biggest crocodile in Europe, known as Big Daddy - around 4.5 metres long and weighing over 500 kgs! The park includes guided tours of the crocodile enclosures, a petting zoo, cafeteria and a souvenir shop. Aqualand Water Park is another major family attraction with exciting rides, including the Kamikaze, one of the highest water slides in Europe. Popular for the young crowd, Torremolinos offers several nightclubs where you can dance the night away and one even has a swimming pool to cool down when things get a bit too hot. There is also more traditional entertainment on offer in the town, including regular flamenco dance shows, and of course, many restaurants and bars. In conclusion, Torremolinos is definitely worth a visit on your trip to Spain!